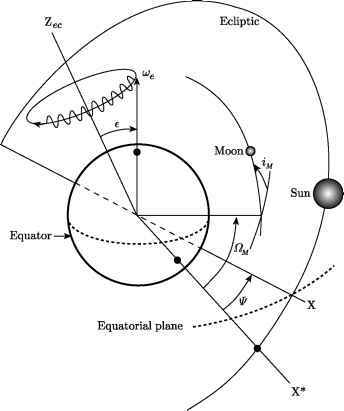 Two new distance measures for stars were developed in the early years of the twentieth century, complementing and extending the traditional measures of trigonometric parallax and what Kapteyn called ''mean parallax.'' The first is based on the connection between a star's spectrum and its intrinsic luminosity, and the second on a type of star known as a Cepheid variable. These tools were developed during the latter years of Kapteyn's career and he did not incorporate into his models of the universe all the new results that astronomers ultimately obtained with them. At the time of the visit by Hertzsprung and Kapteyn, Pickering's astrophysics industry at Harvard had ramped up production to the point of classifying 5000 stellar spectra per month. The data came primarily from telescopes in Cambridge (Massachussetts) and Arequipa, Peru, where the observatory had established a station in 1891. Annie Jump Cannon, the assistant Pickering had hired to classify the stars of the southern hemisphere, was the most prolific classifier. Her ability to recognize spectra by simple inspection is legendary. She could consistently and accurately classify 300 spectra per hour, without reference to comparison spectra. When she needed to concentrate for such a task, she would turn off the hearing aid she had needed since suffering a bout of scarlet fever as a young woman, and ignore the hubbub around her. In the course of her work, Cannon revised the system of classification that Pickering and Williamina Fleming had devised before her to arrive at the classification system that is still used today. She again used the letters between A and O in the alphabet, but she arranged the classes in temperature order — something that was not possible in the early stages of stellar spectrum analysis, before the connection between temperature and the appearance of the spectrum was confirmed. Arranging the classes in temperature order destroyed the alphabetical order. From hottest to coolest, the divisions are: O, B, A, F, G, K, M, which generations of astronomy students have memorized with ''Oh, Be A Fine Girl (or Guy), Kiss Me.'' The white, hot heliumline stars correspond to the O, B, or A types, the cooler, red, calcium-line stars are those of K or M type, and those in the middle, yellow in color and of types F, G, or K, have the hydrogen lines in varying degrees of intensity. 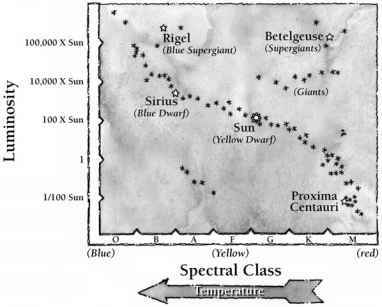 Hertzsprung and the American astronomer Henry Norris Russell, working independently, developed an extremely useful chart that embodies the temperature sequence and almost everything else astronomers knew about the stars in the early part of the twentieth century. The chart, known as the HertzsprungRussell or ''HR'' diagram (figure 7.4), led indirectly to a technique for estimating distances. As Hertzsprung and Russell plotted the absolute or intrinsic luminosity of stars as a function of their spectral class or temperature, they saw that most of the data points cluster in a broad line running from the upper left to the lower right of the diagram. The line is called the main sequence; it encompasses the dwarf stars of all spectral types, A through M.
The clustering of data points on the main sequence shows that the temperature (and hence color) of a star and its luminosity are related. A star of a given color — for example, one which has its most intense emission at a wavelength of 5000 Angstroms, or 5 x 10~7m, in the yellow part of the spectrum — is most likely to be a dwarf star. In this example, the star would have the same luminosity as the Sun because it has the same color. Points that lie above the main sequence generally represent the rarer giant stars. For example, Betelgeuse in Orion has a similar color to dwarf stars of the M class, but Betelgeuse is more luminous and has the c-type spectrum with sharp lines. The data point corresponding to it, at the upper right of the HR diagram, helps define the ''giants and supergiants'' area of the graph. Some points lie below the main sequence. White dwarf stars, for example, have a relatively high temperature like B or A stars but are very small and have low luminosity, so their data points lie in the lower left-corner of the HR diagram. Figure 7.4 The Hertzsprung-Russell or HR diagram, showing the distribution of stars in color and luminosity. The x axis shows color from blue to red, or temperature decreasing to the right. The y axis shows the luminosity in units of the solar luminosity. Most stars have a color (or, equivalently, a temperature) and a luminosity that put them in the so-called main sequence, running from the upper-left to the lower-right corner of the diagram. The blue-white star Sirius, our yellow Sun, and red Proxima Centauri (our nearest neighbor star) all lie on the main sequence, and are therefore also known as dwarf stars, to distinguish them from the rarer giant stars. A smaller number of stars are found with different combinations of color and luminosity. The red supergiants such as Betelgeuse (in the upper-right corner) are unusually luminous red stars, while the blue supergiants such as Rigel (upper-left corner) are more luminous than similarly colored stars on the main sequence. Stars in the lower-left corner of the diagram are hot but dim. The second new method of estimating distances, which emerged directly from work done at Harvard, was that based on Cepheid variables. Henrietta Leavitt, one of Pickering's assistants, found the first clue to the usefulness of this category of star. Her specialty was not the classification of stars but the search for variable stars, which fluctuate both in luminosity and spectral type. Leavitt had graduated from the women's college later known as Radcliffe, and joined the observatory initially as a student and unpaid research assistant. She took charge of a number of projects at Harvard College Observatory, including Harvard's contribution to Kapteyn's Plan of Selected Areas study. Between 1904 and 1908, by a laborious comparison of before-and-after photographic plates, Leavitt identified more than 1700 variable stars in the Large and Small Magellanic Clouds of the southern hemisphere. The stars had similar patterns of variability, repeatedly brightening and dimming (see figure 7.5). They were known as Cepheid variables, so called because a bright star of the constellation Cepheus exhibits this same pattern. luminosity really were related in these special stars, then one could determine a Cepheid variable's absolute luminosity simply by measuring its period of variability. The astronomical community failed to pick up on her remark, so in 1912 Leavitt restated it, this time in eye-catching graphical form. The plot showed a one-to-one correspondence between a Cepheid variable's maximum intrinsic brightness and the period of its variability. Hertzsprung realized the significance of Leavitt's finding, namely, that Cepheid variables could be used as standards of luminosity, and hence as indicators of distance. It is fairly easy to measure the period of variability of a star. The Cepheids Leavitt studied had periods between about 1 day and 270 days. Leavitt's plot allowed one to read off the intrinsic luminosity corresponding to a given period. Once the intrinsic luminosity was known, it was theoretically possible to derive the distance of any Cepheid variable by comparing its apparent luminosity and the luminosity it should have according to the period-luminosity law. All that remained was to calibrate the formula, by determining the specific energy output for a Cepheid variable at a known distance. Hertzsprung calibrated the Cepheid formula in 1913, shortly after his visit to Harvard, and used it to derive the distance to the Small Magellanic Cloud. His result—some thousands of light-years—contained a computational error, and was off by a large factor, but it placed the Magellanic Clouds at a great distance compared to the stars of known trigonometric parallax, which lie within about 100 light-years. Even Kapteyn's estimates of star distances using ''mean parallax'' correlated with proper motion could reach stars at distances only up to about 3000 light-years. Hertzsprung's result was momentous; he had taken the first step that would lead astronomers to fathom the stars beyond our own Milky Way system.